What does “walk off something” means? I suppose this sentence means that the speaker is going to walk along a pier. Is "a walk off" here means a casual walk? Or maybe preposition "off" has a meaning I am not aware about. Dictionaries define "walk-off" only as a baseball term. Could you clarify the meaning of this sentence? As in your question to humorously say you are really fed up and are going to drown yourself in the sea. Nobody would ever expect you to actually do this or be concerned for your safety. @Mixolydian is correct. I am only adding another answer to emphasise that the idiomatic use is really the only use of this phrase you will ever find in normal English. It is usually used by a person as a semi-humorous insult towards another person. 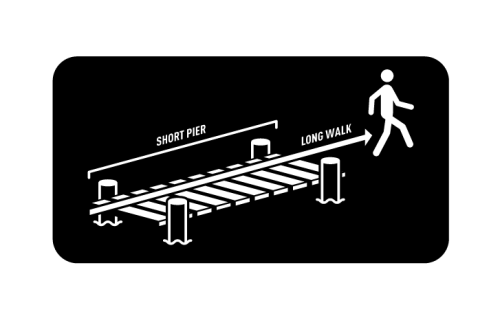 "Go and take a long walk off [or on] a short pier" means "get lost", or "go and drown yourself". In the OP's context, the author is directing this criticism at themselves, probably in a self-deprecating way. Depending on context it could be light and humorous or very dark and literally referring to suicide. "I'm sick of myself - I'm going to take a long walk off a short pier." Finally, I'll mention that I'm more used to the phrase as "Take a long walk on a short pier". It means the same thing, but arguably emphasises the humour better. It is impossible to take a long walk on a short pier ... so you fall off the end and into the sea. Consider "off" to mean "from". To move off something is to leave it. Not the answer you're looking for? Browse other questions tagged meaning meaning-in-context phrase-meaning or ask your own question. does “as often as” mean “every time”? What does “For” mean in the sentence “could you come down here for a second?”? meaning of the phrase “as far as one is concerned with”? Does “as long as” here mean the common known meaning of “as long as”?